And still we are missing out on the colder weather down here in Cornwall and the blessed Roseland. Yep, it is supposed to be winter, but our gardens are behaving like it isn’t. Unseasonably dry until the last week or so, mild as mild can be (we’ve still got our respective windows open all night), it feels like spring is trying to edge winter out before it even starts. Lots shooting already not just in the greenhouse but in flower beds (gladioli and all sorts of herbaceous anyone?) but be vigilant! Any time, we could have some snow or frosty nights that will scorch or scupper your new growth. Have some compost or well-rotted manure in reserve so you can speedily add a layer of protection to your new growth, and if you have pots or tender greenhouse material, be ready with some lightweight fleece. Just that thin layer will stop any freezing water making contact with new leaves and shoots, and avoid that burning which is so unsightly and which can see off something particularly tender. That said, with all these bright days, and the mild air, it is difficult to hold back on planting seeds. We’re just champing at the bit. What you can safely start off now are chillis and sweet peppers, which actually need a long growing season to really succeed in our climate. And the hotter the chilli, the longer it needs. Both need a little heat underneath to get going quickly to bring the soil temperature up to between 18-22 degrees. 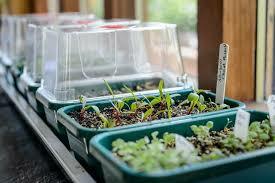 Place in covered containers on a bright east or north-facing window sill (not south like Helen did and watched all her new seedlings shrivel up last week on a sunny day– grrr) and when the seeds germinate, uncover so that the seedlings don’t damp off in the humidity of the covered environment. Yep, we’ve done that too- double grr. Once the seedlings are big enough, transplant carefully to 9cm (and that is the diameter) pots and bring on in a warm environment until you see them really take off. Also good to get going now, are, on the flower front, sweet peas, and on the veg front, broad beans, peas and pea shoots. They don’t need heat underneath, but do need a bright windowsill like the peppers. They also do much better if you can give them a long root run to get started before they go out to their final planting positions in the garden. You can buy long root trainers, but if you prefer to reuse and recycle household waste, you can use the inside of loo rolls, or get a paper potter which enables you to make pots of any size out of newspaper. Both paper and cardboard will gradually compost away in the ground, so you don’t even need to wheedle the seedlings out of their containers if you don’t want to. 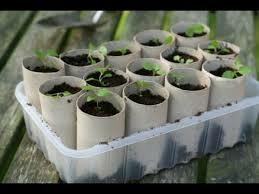 Same applies to peat and coir pots. A word of caution though – anything pea or bean-like is a meesy mousey magnet, especially on the point of germination. Irresistible to our furry friends. So make sure you can keep them somewhere away from the blighters, or be prepared to swear a lot (or is that just me?) and replant often. Some folks are venturing into planting tomato seeds too. After getting our fingers burned with that cold spell in late spring last year, we are giving it a few more weeks. That doesn’t mean you have to if you have the space to keep them warm and growing if we get hit again, but we don’t. Later sowings soon catch up anyway. 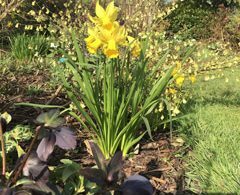 And if you are planting veg or flower seeds at the moment, do plant a couple extra ready for the Veryan Seed and Plant Swap/Sale on 18th May in Veryan Village Hall (see the News Section of the website for more information). Your plants will be very welcome. Seed potatoes and onion and shallot sets are now in garden centres, and in the very best (!) 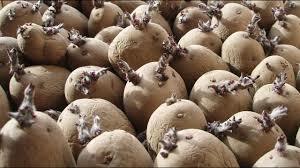 you can buy them loose so you can have as many or a few as you like, and choose the very spud and onion you want. Too early to plant spuds directly into the ground really, unless you have a covered area and nice warm soil, but you can get them chitting on the window sill. Chitting, while not absolutely essential, just encourages some root growth before they go in the ground so the plant is not hampered by too cold soil. Onions can go in now and remember to leave to pointed end proud of the soil. 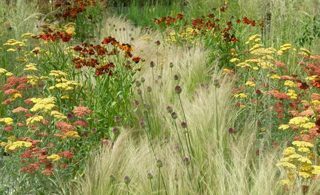 They don’t need a deep root run so are useful for a shallow bed, but equally, they don’t like to dry out (they will go to seed) or be surrounded by weed (they just sulk) so do need keeping an eye on. 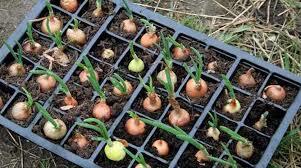 You can even start them off in trays. Other jobs left over from last month (we are still only part way through ours at time of writing) is fruit tree and bush pruning. As we mentioned last month, it is best to prune these during the dormant period, such as there has been one this year. All ours have next spring’s buds already. A reminder – prune apples, pears trees, quince and medlar (the pome fruits), gooseberries, autumn raspberries, grapevines and currants. Anything with a stone (cherry, plum, gage etc), prune these after fruiting in late summer. plant new bushes and trees, subject to the soil not being too cold or waterlogged. And it is still a great time to plant fruit trees and bushes, not to mention deciduous hedges, trees and shrubs. So, wrap up warm, get some vitamin D, fight off that cold, and set some new life going. You’ll just be amazed at what a good feeling it gives you.